Welcome to the third edition of Dipper’s Quips, an “advice” column from the other half of this website, the dog. This time, Dipper shares some wisdom about Christmas! But be warned—this is only his second real holiday season. D: Cranberries! Well, turkey and cranberry treats, like these ones here. After recently a recent bout with a urinary tract infection, Tori’s been on the hunt for things that’ll help prevent future UTI. As with humans, cranberries can’t cure infection, but they can help prevent them. Tori says it has something to do with changing the pH levels in urine. I have no idea what any of those words mean. Dipper, I’d like to take my dogs to meet Santa for photos. Do you have any tips? – Sharon G.
D: Yeah, here’s my tip: don’t do it.
. . . That was a bit dramatic, but if you do insist that your dogs meet the big man himself, there are a few things to consider. Number one: avoid mall Santa sessions like they’re fleas. For our first Christmas together, Tori and I waited in line for what she says was something like four hours. As a dog, that’s a decent chunk of my life gone. Beyond being a massive waste of my time—could’ve been sleeping instead—it was also pretty unpleasant. Take over a hundred rowdy, confused dogs not allowed to play with each other in a bright, echo-y mall and you have the makings of a disaster. Not to mention the frustrated, annoyed owners—we almost saw more human fights than dog fights! Frankly, you’ll have a better time walking your dogs to the North Pole to meet Santa there than you will waiting in line at the mall. But that doesn’t mean you can’t take your dogs to meet Santa. Just not a mall Santa. 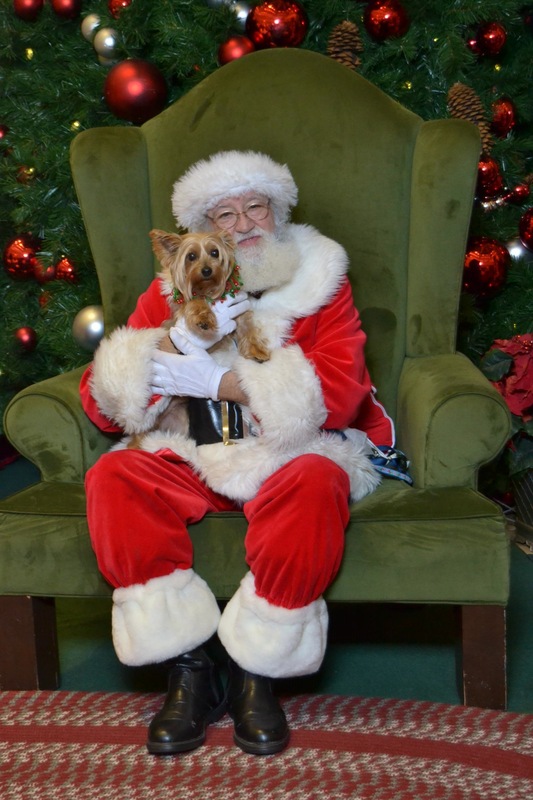 Pet stores, shelters, and other pet-related places will usually have their own Santa-sessions just for us furry friends! Hosted by people who really understand pets, they’re less hectic and have shorter lines. Try one of those instead—we keep track of them here on our events calendar! D: Oh boy! Not only have I been a good boy, I’ve been the best boy! Through it all—the disgrace of wearing a costume to the PAWS Mutt Strut, suffering through the presence of annoying dogs at the park, and even surgery—I’ve been well-behaved! I promise. Just don’t listen to what Tori says. I’d like a hundred bully sticks now, please.